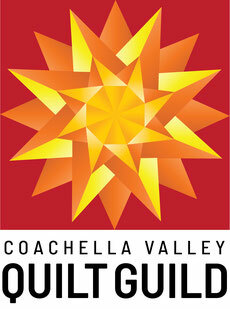 The Desert Guilds Quilt Show is presented by three quilt guilds: Cactus Sew-ables Quilt Guild, Coachella Valley Quilt Guild, and Pass Patchers Quilt Guild. The show is a biennial event held in the even-numbered years. It is traditionally held the first weekend in March. This show is a major fundraiser for all three guilds and there are many ways to participate. One quilt can be entered by each active member of the three guilds. Viewer's Choice 2018 -- Pat Siegel -- "Passing Time"
Directions for the challenge quilt are provided and materials are sold at guild meetings for a nominal charge. Awards for this category are given out at the individual quilt guilds the month before the show and are displayed in full at the quilt show. The quilt show is a non-juried show. Ribbons are awarded from the vendors, the Quilt Show Committee, and each Quilt Guild. A Viewer's Choice Award is presented at the end of the show for each of the four categories. Each guild can decide whether or not they want to participate in the boutique. All items are hand made and donated by guild members. Each guild receives the money made from items donated by their own guild. We would love to have donations from each of you! !